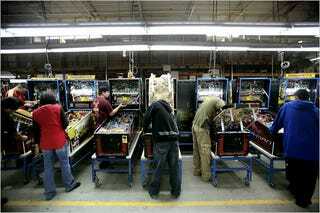 Did you know that there's only one manufacturer of pinball machines left in the world? That sole survivor of the pinball age is Stern Pinball, based outside of Chicago, and it's the last purveyor of this relatively low-tech entertainment left. And things aren't entirely rosy for Stern Pinball. While they used to pump out 27,000 pinball machines a year, they're down to a mere 10,000 now, most of which end up going to homes rather than to arcades. It's a sad state of affairs. But the owner, Gary Stern, can't really imagine that pinball is on the way out. He thinks that it's like a sport; while it may wane in popularity, it'll never go away. What do you guys think? Have video games made pinball machines antiquated and obscolete, or do they still hold a place in your heart?